A skin tag on the corner of your mouth doesn't present any medical concerns, but it may be a nuisance while eating and considered a cosmetic concern. There is no way to prevent skin tags, which are simply over-growths of skin tissue formally called acrochordons. Skin tags are not uncommon by age 60, though a growth on the mouth is less typical than growths in folds of skin on the armpits, groin, neck and beneath the breasts, according to Aetna's InteliHealth. Skin tags are permanent; they do not shrink or go away on their own. The only remedy is removal. 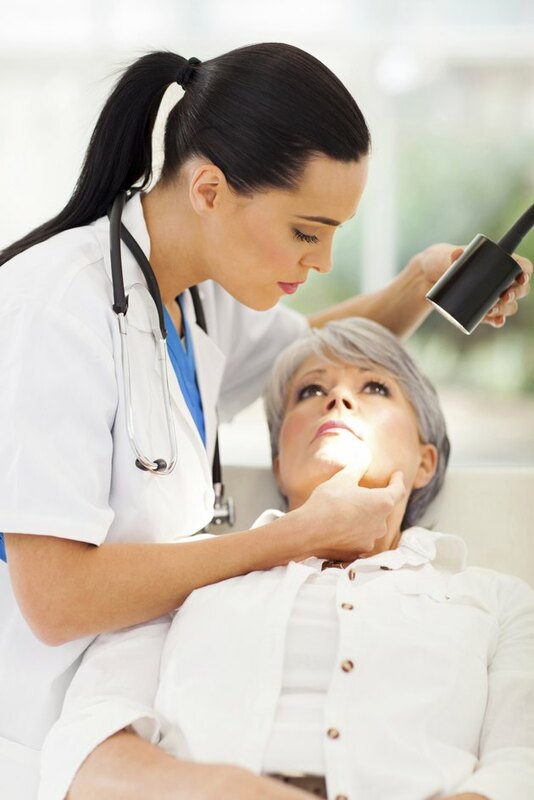 Undergo a medical examination by your primary care physician or your dermatologist. Your doctor should confirm that the growth on the corner of your mouth is a skin tag. What may appear to you to be a skin tag may be something else requiring treatment such as a viral infection or viral wart. For this reason, removing your skin tag at home is not advisable. Allow your doctor to remove the skin tag. The area will be numbed with a freezing agent or local anesthetic. Your doctor will cut off the growth using a surgical blade or scissors. In other instances, cryosurgery or electrosurgery are employed to freeze or burn off the skin tag, respectively. Compress a bandage or clean cloth to the area of the mouth where the skin tag was removed if you experience any bleeding at home. Moderate pressure for a few minutes should suffice. Apply a topical antibiotic to the area once bleeding stops. Keep an adhesive bandage over the area as needed, changing it daily or after it gets wet. If bleeding doesn't stop within half an hour, seek medical assistance, advises MayoClinic.com. Discontinue use of a topical antibiotic if a rash results. Skin tag removal is probably not covered by your medical insurance, notes Aetna InteliHealth. Because skin tags pose no medical risks, removal is considered an elective cosmetic procedure.